A film crew from BBC Midlands Today visited Three Snowhill to discuss the findings of Deloitte Real Estate’s annual ‘Crane Survey’. Reporter Peter Plisner and his cameraman shot the spectacular views from the 19th floor of the building, and even paid a visit to one of our three crane drivers! Now in its 16th year, Deloitte Real Estate’s Birmingham Crane Survey is a much-anticipated snapshot of development in the city. This year, the survey records more than 1.4m sq ft of office space under construction in the city. This is an historic high, with the ten-year average less than half that at 567,000 sq ft.
Record take-up of more than 1m sq ft in 2017, 49 per cent of which was pre-let, is underpinning confidence in the market. Deloitte Real Estate partner Edwin Bray told the BBC: “Over the past three years Birmingham has witnessed a resurgence in development and whilst many commentators expected to see a downturn in activity due to political and economic uncertainties, it is quite the opposite. 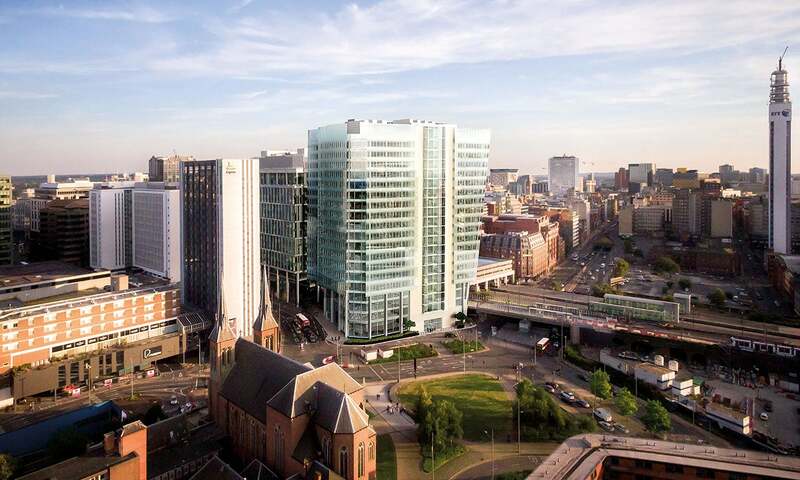 At 420,000 sq ft Three Snowhill is the largest single office building under construction in the UK outside London. Richard Probert, Three Snowhill project director, was also interviewed for BBC Midlands’ evening news segment.